II. Arts & Economic Prosperity 5: PA (AEP) – Statewide release of the most current statewide study on the economic impact of the nonprofit arts sector in Pennsylvania. CHESTER MADE is an arts-based initiative to help recognize and promote arts and culture in the City of Chester. The project is coordinated by the City of Chester, Chester Arts Alive!, Widener University, Gas & Electric Arts, and Pennsylvania Humanities Council. An ensemble of artists from Chester are asking local youth, seniors, artists, preservationists, community leaders, business owners, Widener students, and residents to share their personal stories of where and how local arts and culture make a difference in their lives. From these sessions and a survey, a map will be created to show where “arts and culture happen” in Chester and explore why such places and activities really matter to the community. The initiative is part of the Chester Cultural Corridor (or “C3”) and includes a focus on developing a mile-long corridor from Widener University to City Hall along the Avenue of the States. The idea is to use the arts and dialogue as the foundation for revitalizing and showcasing the Chester community. Major support for the Chester Cultural Corridor has been provided by the Pew Center for Arts and Heritage, with additional support from PECO and the National Endowment for the Humanities. using evidence to anchor, reinforce, and re-interpret our understanding of life on Earth. Through collaborations with diverse learners and broader communities, we create an active, inclusive science learning environment that captures the imagination and helps people understand how science is vital to our lives and society. A Pilot Project between Pennsylvania Department of Aging, the Pennsylvania Council on the Arts, and Elders Share the Arts. AGING IN PA – WHY NOW? Currently, Pennsylvania is the fourth “oldest” state in the nation, with nearly 2.7 million individuals aged 60 and older and more than 300,000 individuals aged 85 and older. By the year 2030, it is estimated to exceed 3.6 million Pennsylvanians will be aged 60 and older. Many of Pennsylvania’s older adults reside in the 48 of Pennsylvania’s 67 counties that are rural. Many live alone and some live at or below poverty level. Others suffer from one or more chronic health conditions. Additionally, there are many that are at risk of abuse, neglect, abandonment, or exploitation. Through outreach to its partners in the aging services network and, most importantly, to the consumers of its services and supports, the Department identified innumerable opportunities to address the needs of older Pennsylvanians. New goals will help the Commonwealth of Pennsylvania enhance the current system and continue to serve older residents through a high quality, cost-effective, responsive system that clearly makes Pennsylvania the best state in which to age. Despite the fact that the people who span different generations have varying life experiences, cultural references, and exposure to educational opportunities, they all share the same very human needs: to create, convene, learn, and express themselves. The arts are the perfect lens through which older adults may explore life and share their personal experiences with others. 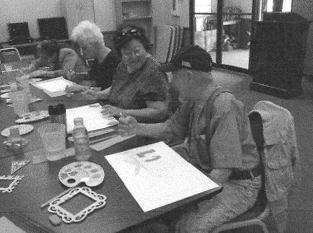 Creative aging focuses on the role of the arts in enhancing the quality of life for older adults. In 2006 a national research project conducted by Gene Cohen, M.D., Ph.D., Director of the Center on Aging, Health & Humanities at George Washington University in Washington, D.C. The study, titled “The Impact of Professionally Conducted Cultural Programs on Older Adults,” demonstrated that professionally conducted, sequential arts-learning programs promoted better health and disease prevention among older adults who actively engaged in them. This training brings together two Pennsylvania government agencies and a nationally-recognized arts organization to train 15 teams comprised of professional teaching artists, senior centers and community arts in education organizations in how to implement evaluate and sustain creative aging arts programs for older adults. 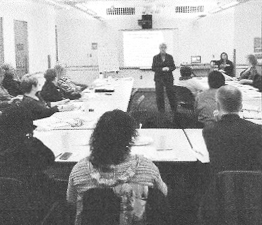 This innovative three day training allowed two sectors to strengthen ties between two agencies. Understand expectations between partners; created deeper buy-in from senior center agencies; shared resources; expand knowledge of what is available and possible to centers. The Pennsylvania Department of Aging leads the way in safeguarding and enhancing the lives of older Pennsylvanians, their families, and caregivers throughout the commonwealth. The Department’s mission is dedicated to enhancing the quality oflife of older Pennsylvanians by empowering diverse communities, the family, and the individual. At its foundation are prevention and protection: 1) Prevention from instability in health and well-being that may result in institutional care and dependence on government aid. 2) Protection from abuse, neglect, abandonment, and exploitation. The Pennsylvania Council on the Arts (PCA) is a state agency charged with fostering the excellence, diversity, and vitality of the arts and broadening the availability and appreciation of those arts throughout the state. It strives to make the arts available to all Pennsylvanians so they may enjoy the various benefits that can be gained from a vibrant arts infrastructure. These benefits include enhanced quality of life and occasions for intellectual and emotional discovery through engagement in the arts and in the creative process. Participation in the arts can also increase economic activity, promote tourism and offer substantial educational enhancements for children and youth. Activities that nurture creative aging can provide lasting health benefits for older Pennsylvanians and in senior centers and veterans homes foster a new standard for quality of care. 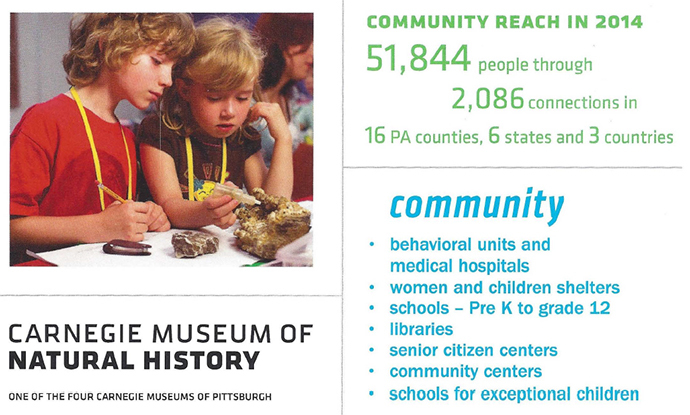 The PCA distributes arts funding through more than 1,000 responsive grants; undertakes partnerships and initiatives to seek solutions to challenges, leverage opportunities, and serve a broad spectrum of arts participants, artists, and arts organizations; provides technical assistance; and, acts as a resource for arts related information. Elders Share the Arts (ESTA), founded in 1979, is an award-winning community arts organization that has been at the forefront of reimagining the possibilities of growing older for over 35 years. Using art to create meaning and purpose in this last stage oflife, EST A’s professional teaching artists offer high-caliber evidence based arts programming that ignites creative expression, cultivates older adults’ role as bearers of history and culture, and generates new pathways to connect them to their communities. Purpose of the Study: to measure the impact of professionally conducted community-based cultural programs on the physical health, mental health, and social activities of individuals aged 65 and older. Subjects: 300 people (living mostly independently) aged 65 to 100 (average age of 80) from three areas of the US (Brooklyn, NY, Washington, DC and San Francisco, CA). Half were assigned to the intervention group and half to the control group. The intervention group participated in various professionally run activities: writing, poetry, singing, dance, drawing and painting, to name a few. The control group was assessed on the basis of their usual activities. The study ran for three years beginning in 2001. Assessment Tools: a total of five questionnaires measured three areas of functioning: 1) general assessment of health and problems across the systems of the body, medication usage and health care utilization data; 2) mental health assessment; and 3) social activities assessment, utilizing a detailed inventory of the subject’s activities, with attention to the nature, frequency and duration of the activities. Findings: subjects in the intervention group reported a higher overall rating of physical health, fewer doctor visits, less medication use, fewer instances of falls, better morale, fewer feelings of loneliness, and a trend toward increased activity than did the control group. Implications: the positive impact of participatory art programs for older adults in this study on overall health, doctor visits, medication use, falls, loneliness, morale, and activities reflects important health promotion and prevention effects and a reduction of risk factors driving the need for long-term care. Just 8 cents savings in medication use per person per day would save $1 billion a year for the Medicare D eligible population. Study Sponsors: National Endowment for the Arts (lead sponsor), the Center for Mental Health Services of the Dept. of Health and Human Services, the National Institute of Mental Health of the National Institutes of Health, AARP and the National Retired Teachers Association, the Stella & Charles Guttman Foundation and the International Foundation for Music Research (NAMM). The Mercy Hilltop Center, Inc.
Project Example from Crispus Attucks Senior Center in York, PA. This collaboration between the PA Dept. of Aging and the PA Council on the Arts was developed to bring new opportunities to seniors by providing arts learning opportunities. The 14 projects in this first phase created engaging, accepting and inspiring environments at senior centers across the state. The economic impact of the film industry has averaged $100 million annually for the last 6 years.